Cysts associated with arteriovenous malformations (AVMs) are either secondary to hemorrhage or after radiosurgery. Untreated and unruptured AVMs with large cysts are rare. We here describe a child with medial parietal AVM associated with cyst, without any history of hemorrhage or radiosurgery. Surgical excision led to cure for the patient. Arteriovenous malformations (AVMs) present with hemorrhage, seizures, headache or focal neurological deficits. Cysts associated with AVMs are uncommon, and are usually a sequelae of stereotactic radiosurgery  or after a hemorrhage. Untreated and unruptured AVMs with large cysts are uncommon, with only five cases reported in literature, and one in the pediatric population. ,,, We describe a case of an untreated and unruptured AVM in the right parietal lobe, which was associated with a large cyst. An 8-year-old boy presented with history of generalized tonic clonic seizures for the last 2 years. There was no history of sudden onset headache or neurological deficits, suggestive of bleed. On examination, there were no focal neurological deficits. An MRI was performed, which showed a nidus, seen as flow voids, in the medial parietal lobe on the right side with a large cystic area abutting it posteriorly. This was hyperintense on T2-weighted images and inverted completely on FLAIR images [Figure 1]a and b. There was no evidence of hemorrhage on SWI (susceptibility-weighted images). A digital subtraction angiogram was subsequently performed, which showed the nidus was receiving arterial feeders from the pericallosal branches of the right anterior cerebral artery and draining into the superior sagittal sinus via cortical veins [Figure 1]c and d.
Various treatment options were discussed, and the patient was offered surgical excision of the AVM as the first choice. He underwent a parietal craniotomy and excision of the AVM. The AVM nidus and the draining vein was seen on the surface, and below that, there was a large cyst containing about 30 mL of clear fluid. The appearance of the fluid was like that of CSF. The AVM was completely excised, and the cyst was drained. Histological examination of the nidus showed abnormal arterial and venous channels, and the cyst wall had numerous thin-walled vascular channels containing hemosiderin in the fibrous tissue. A post-operative angiogram was done on post-operative day two, which showed complete excision of the nidus [Figure 1]e and f. His post-operative stay in the hospital was uneventful, and was discharged on the third post-operative day. At 6-month follow-up, patient is neurologically normal, and is seizure-free on a single anti-epileptic drug. AVMs associated with cyst without undergoing radiosurgery are extremely rare. In previously reported literature of 5 cases, there were 2 females and 3 males, with age between 14 and 38 years. ,,, Our patient is the youngest case of this type of association, and is only the second patient in pediatric age group reported in the literature [Table 1]. Three of the patients presented with seizures, 1 with headache and 1 with a focal neurological deficit in the form of a superior quadrantanopia. In 4 of the 5 patients, the AVMs were located in the temporal lobe and 1 was located in the parietal lobe. Three cysts contained xanthochromic fluid, while 2 contained degraded bloody fluid. In the present case, the fluid was clear, without any xanthochromia. All AVMs and associated cysts were successfully removed by surgical excision with good results. Cysts accompanying AVMs have been attributed to cavity formation secondary to liquefaction of the hematoma, which forms due to the bleeding in the AVM. The cases reported in literature had no history to suggest any previous episode of hemorrhage, and neither had received stereotactic radio surgery. In our case as well, there was no history suggestive of bleed or previous radiation treatment. The mechanism of formation of large cysts associated with AVMs is not known. Different authors have propounded different theories to account for their formation. Multiple hemorrhages in a long period  and exudation of fluid from part of the AVM  have been suggested as the etiology for cyst formation. Hatashita et al. reported the histology of the cyst wall and showed numerous thin-walled vascular channels and deposits in fibrous tissue, which are also seen in the membrane of the giant cysts associated with cavernous angiomas. Hence, they suggest that a capsule forms around the minor hemorrhage from the AVM resulting in the cyst and repeated subclinical hemorrhages from the neovascular channels of the cyst wall result in the growth of the cyst. Itakura et al., have propounded the theory of gradual exudation of fluid into the surrounding parenchyma resulting in cyst formation. In the present patient, the fluid in the cyst was clear, without any xanthochromia or hemorrhage, and the characteristic of the fluid was similar to CSF on imaging. The histology too showed no evidence of hemorrhage or slit - like cavities in the cyst wall. Hence, we are in concurrence with this theory of gradual exudation of fluid causing the cyst associated with the AVM. AVMs are uncommonly associated with cysts without bleed or radiosurgery. These can occur secondary to microhemorrhages or exudation of fluid from the part of the AVM. Resection of the AVM leads to complete cure of the patient. 1. Izawa M, Chernov M, Hayashi M, Nakaya K, Kamikawa S, Kato K, et al. Management and prognosis of cysts developed on long-term follow-up after Gamma Knife radiosurgery for intracranial arteriovenous malformations. Surg Neurol 2007;68:400-6. 2. Boyd MC, Steinbok P, Paty DW. 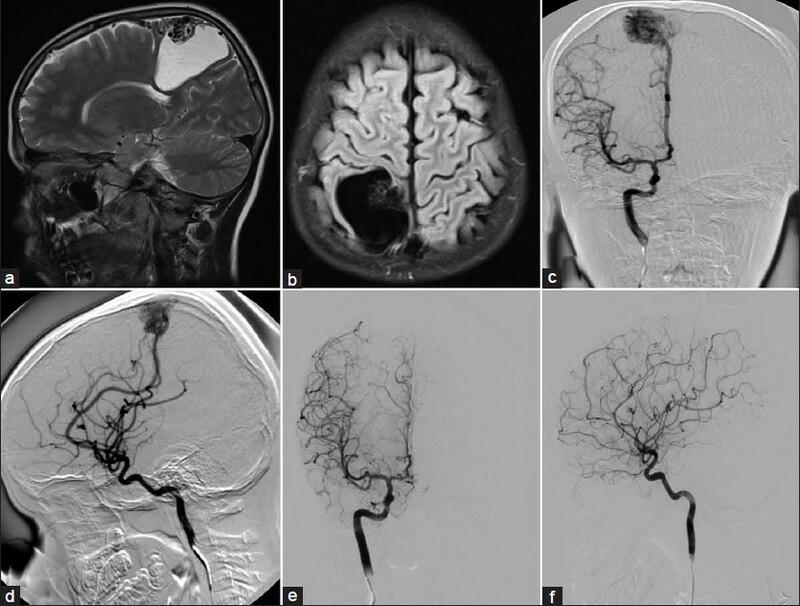 Familial arteriovenous malformations. Report of four cases in one family. J Neurosurg 1985;62:597-9. 3. Itakura T, Takifuji K, Ozaki K, Itakura K, Nishiguchi T, Hiyashi S, et al. Cystic arteriovenous malformation. Acta Neurochir (Wein) 1989;96:154-8. 4. Yamaguchi T, Shinoda S, Masuzawa T, Abe F. A case of arteriovenous malformation with cyst formation. No Shinkei Geka 1993;21:453-7. 5. Hatashita S, Tajima A, Takeuchi K, Ueno H. Arteriovenous malformation associated with large cyst. Neurol Med Chir (Tokyo) 1995;35:377-9.